Sturdy and easy to position, the 6500 features a unique direct-pull rod linkage for smooth effortless action. Low-profile & lightweight aluminum Flush Base Design. Hinged Memory Locks are included at tube joints to guarantee 100% repeatable, precise height settings every time. Offset Direct Pull Action provides direct pedal-to-hat response. DW's patented Delta Ball-Bearing Hinge is a state-of-the-art lightweight aluminum design that incorporates ball bearings at both sides. The SM379 Locking Clutch comes standard and allows you to dial in closed "sloshyness" and lock it so it doesn't come loose. 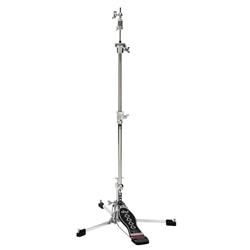 Upper Rods come standard in two lengths (21" and 15"), allowing you to customize the Hi-Hat Stand for your specific needs. 5/8" upper tube. 3/4" base tube. Wt. 5.9 lbs. Max playing height: 35". Min playing height: 28". ? *Playing height varies depending on cymbals.